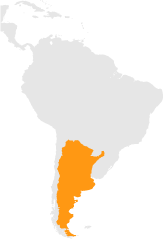 Argentina is located at the southern tip of South America. It is the second largest country inSouth America and eighth in the world. It has a north-south extension of 3,800 km and from east to west for 1,425 km. It borders Bolivia and Paraguay on the north, Brazil, Uruguayand the Atlantic Ocean on the east by the Atlantic Ocean and Chile on the west and south.